The technicians at Jordan's Automotive have years of experience working on standard 4-wheel drive (4x4) vehicles as well as all-wheel drive (AWD) vehicles. AWD is a full-time 4-wheel-drive system (all four wheels receive torque from the engine simultaneously) that employs a center differential that allows each tire to rotate at different speeds. Wheel alignment (or simply alignment) is standard car maintenance that involves adjusting the angles of the wheels so that they are set to the manufacturer's specifications. The main purpose is to let the suspension and the steering systems operate at their desired angles - this reduces tire wear. Alignment is a complicated process and not all mechanics get it right. To have experts handle your car's alignment, visit Jordan's Automotive. The differential transfers the engine power to the wheels. One important function of the differential is to pass on power to the wheels while allowing them to rotate at different speeds - thus the name differential. When turning, the outer wheels travel a larger distance than the inner wheels do (also the front wheels travel a longer distance than the rear wheels). This means that all four wheels travel at different speeds during a turn and this is where the differential comes in to help. To make sure your vehicle's differentials are working properly, have them checked regularly. Contact Jordan's Automotive today for differentials examination and servicing. A driveline is a part of your motor vehicle that connects the engine and the transmission to the wheel axles. The driveline consists of the parts of the powertrain less the engine and transmission. Failure of the driveline means that the car would not move since energy cannot be transmitted from the engine to the wheel axles. Therefore, make sure that your car's driveline is regularly inspected and serviced. And, at Jordan's Automotive, you can have the driveline serviced by experts. A wheel hub motor, also referred to as a wheel motor, is an electric motor incorporated into the wheel hub and drives it directly. You can have a safer and smoother ride today by replacing your warped and worn out wheel hubs. Let Jordan's Automotive replace your worn out hubs today. Properly working seals provide oil and grease sealing - offering enhanced performance in a wide range of temperatures and environments. Worn out or warped seals allow external contaminants to enter the bearing unit or let lubricant escape from the unit. This ultimately leads to premature failure of the bearing unit. To keep out contamination and retain lubricant in the bearings, have the seals replaced with new ones. To have the seals replaced by experts, contact or visit Jordan's Automotive today. Studs are the threaded fasteners that hold on the wheels of your truck. The wheel studs are permanently mounted on the wheel hub through the brake disk or brake drum. To secure the wheel, nuts (lug nuts) are fastened over the stud. Stripped wheel studs can be quite dangerous. Damaged wheel studs should be replaced with new ones immediately. To have your truck's wheel studs replaced with high quality ones, call 239-277-5234 or visit Jordan's Automotive today. A wheel nut or lug nut is a fastener for securing a wheel on the hub. A set of lug nuts are used to secure a wheel to the threaded wheel studs (which are fixed to a wheel hub). Worn out nuts means one thing - the wheel is not fixed securely on the vehicle which puts the vehicle at the risk of rolling over. 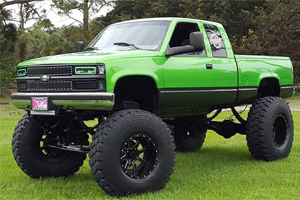 To have your truck's wheels securely fastened to the hub, contact or visit Jordan's Automotive in Fort Myers, FL 33966 today. A transfer case is a part of a four wheel drive system found in four wheel drive and all wheel drive vehicles. The transfer case receives power from the transmission and sends it to both the front and rear axles. This can be done with a set of gears, but the majority of transfer cases manufactured today are chain driven. The transfer case is connected to the transmission and also to the front and rear axles by means of drive shafts. Trust the automotive experts at Jordan's Automotive for all your transmission repairs. Transmission repair is not something to take lightly. The transmission is connected to key parts of your vehicle and needs to be working properly for your safety. Transmission services include replacing filters and draining fluids to prevent transmission damage. Typical transmission issues that may lead to repair may include shifting issues, slipping, stalling, fluid leaking, and the service light turning on. If you are concerned that you may need transmission repair, don't hesitate to schedule an appointment at Jordan's Automotive today. Wheel bearings are found inside of wheels, allowing the wheels to spin freely, and are connected to the brake system. They can become worn over time, causing a vibrating suspension and noisy rubbing as the car is driven. If they break completely, the vehicle will become very difficult to control and unsafe to drive. Replacement interval for wheel bearings varies greatly, but they should be checked for leaks and wear periodically. Jordan's Automotive can make sure that your bearings are in good shape and let you know if they need replacement.